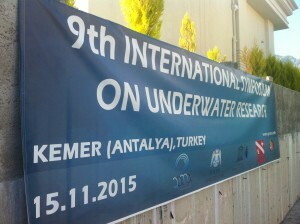 During the 9th International Symposium on Underwater Research (15th November, Kemer/Antalya- Turkey), Silvia Zingaretti from Università Politecnica delle Marche presented the preliminary results achieved during the first months of collaboration between BURC, UNIVPM and UBICA to develop “An innovative and flexible Android based platform for an underwater scooter to acquire data from the marine environment”. Tagged BURC, congress, results, UBICA, UNIVPM. Bookmark the permalink.